DR. DAWN NEUMANN: Hi, this is Dawn Neumann, and I’m an associate professor at IU School of Medicine in the Physical Medicine and Rehabilitation Department, and the Research Director at the Rehabilitation Hospital of Indiana, and this is your Assistive Technology Update. JOSH ANDERSON: Hello and welcome to your Assistive Technology Update, a weekly dose of information that keeps you up-to-date on the latest developments in the field of technology designed to assist individuals with disabilities and special needs. I’m your host, Josh Anderson, with the INDATA Project at Easter Seals Crossroads in beautiful Indianapolis, Indiana. 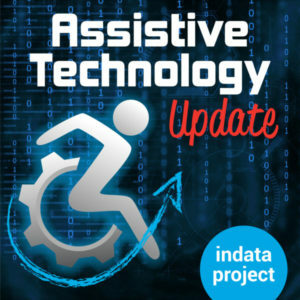 Welcome to episode 396 of Assistive Technology Update. It’s scheduled to be released on December 28, 2018. We hope that everybody had a wonderful Christmas and is looking forward to New Year’s. We are very excited about our show today where we have dr. Dawn Neumann, PhD, to talk about the apps she’s helped develop for her friend Steve Sutter over at CreateAbility, called My Emotional Compass. We also have Amy Barry on for an App Worth Mentioning about Microsoft soundscape, which we’ve had on the show before. We will get their take on it. Without further ado, take it away, Amy. AMY BARRY: This is Amy Barry with BridgingApps, and this is an app worth mentioning. This week’s featured app is called Microsoft soundscape. Croissant soundscape is a wayfinding app for the iOS platform intended to be used by people who are blind or low vision. Unlike commonly used mainstream GPS apps, soundscape does not provide directions to locations, but provides a user information about the world around them using a combination of spoken feedback, and positional 3-D audio. People with visual impairments can use the app to learn about landmarks around them that they may have been unaware of. Combined the app with another that provide directions to a location for extra feedback while on the route, or use the app speaking feature to find a specific location or landmark. Soundscape’s main method of providing information to the user is the callouts as a user passes landmarks. Other information provided automatically includes the direction the user is facing as well as information on upcoming intersections. When soundscape calls out information, the information will come from the position of the landmark it is announcing. For example, if you pass a point of interest on your left, soundscape will speak from your left your phone. Microsoft soundscape is available for free at the iTunes Store and is compatible with iOS devices. For more information about this app and others like it, visit BridgingApps.org. JOSH ANDERSON: Folks, we can all use a little emotional regulation sometimes. Maybe even more so right after dealing with a family over the Christmas holiday. It’s not always easy to control our feelings and deal with situations, especially ones that aren’t expected as they arise. The problem gets compounded would may be a disability, mental illness, dramatic brain injury, or something like that is added to the mix. On today’s show, we are excited to have, Dr. Dawn Neumann, PhD, on to talk about the My Emotional Compass app. Dawn, welcome to the show. JOSH ANDERSON: We are very excited to talk to you today. Can you start by telling our listener a little bit about yourself and your professional background? DR. DAWN NEUMANN: Sure. I have a Masters in something called cognitive psychology and a PhD in rehabilitation science. I assume many of you out there might be wondering what rehabilitation science is. It’s actually quite simple. It’s just ultimately a scientist who does research that determines what kinds of therapeutic strategies actually work or don’t work when it comes to treating physical, cognitive, and emotional problems in people who often have some kind of neurological injury or disorder. Specifically, in terms of the research that I do, most of what I focus on, like you had mentioned, is emotional deficits and problems after brain injuries. I like to try to understand what is actually causing the problem, because emotions can be quite complex, and people with brain injuries can also be quite complex, and original person is different. So it’s really trying to understand why these emotional problems are rising, and then from the information kind of figuring out what are the best strategies for trying to treat them. JOSH ANDERSON: Very nice. How did you first come up with the idea for the My Emotional Compass app? DR. DAWN NEUMANN: It has sort of a long history. JOSH ANDERSON: That’s fine, we had plenty of time. DR. DAWN NEUMANN: From the research I’ve been doing – like I said, I’m focusing on these emotional problems after brain injury – one of the important things we learned was almost and Ah-ha! moment, is that we learn the people with brain injury often have a hard time recognizing when they are having an emotional response. They might not know, so they can be just there, and something may happen, and it can cause them to be very angry. But they may not recognize that they are feeling angry or that they are even having a response at all. In other situations, maybe the person knows that they are having an emotional response, but they really may have difficulty in knowing exactly what they are feeling, so they might not feeling that they are sad or afraid. This lack of information, not knowing when you’re having an emotional response, or not knowing what in fact you are actually feeling, this can be quite problematic. When I think about it, I always find it in the aspect of if you’re going to control something, you need to know what you are controlling. If you don’t know that you’re having an emotional response or what you’re feeling, you really don’t have much of a chance in controlling that and regulating that. That can be a problem. It’s really important for us to be up to have this information, this insight about our feelings so that we can be kind of in the control seat and regulate our emotions rather than them controlling us. JOSH ANDERSON: So how does the app work? DR. DAWN NEUMANN: The app is designed in such a way that follows the small the has been treated – and I’m not the first person to come up with this model. Ultimately, when you think about emotions, there are a couple of dimensions when you have emotions. We have pleasant or unpleasant emotions. When we have an emotional response, it also triggers something called emotional arousal, that kind of level of energy that we have that accompanies that emotion. On one plane, if you will, we have that pleasant or unpleasant emotion. On the other plan, on the Y axis got you can have your emotional arousal, whether it is you are highly emotionally aroused or you have low emotional arousal. This app was created using that model. The idea is that if you can start with those two endpoints, then that gives you a starting place. Like I said before, it’s very often the people with brain injury or even other people outside of brain injury can have a difficult time organizing what they are feeling, so they may have to start off with something being very broad, very vague. It’s not giving you a whole lot of information. But if you can’t enter it with, hey, I’m feeling quite unpleasant right now. What does that emotional charge – we often say emotional charge instead of emotional arousal. People tend to relate to that. The level of energy that you have when you are experiencing that emotion. I’m feeling quite unpleasant and I’m having a high emotional charge or high emotional arousal. This basically puts us in a particular quadrant of this compass. The whole idea of this compass and these anchor points help us navigate from a broad emotional feeling to something more specific. In that quadrant, there are options of what types of emotions that one might expect would go along with feeling unpleasant and highly emotionally charged. For instance, feeling angry or fearful or terrified, these are highly emotionally charged words and typically in the unpleasant quadrant, so to speak. When you think about the compass, when you open up the compass, it’s kind of designed in a particular way to help give people the ability to kind of think about what it is they are feeling and assign a label to it. It gives them the opportunity to do this independently without any kind of guidance or assistance. So you can type in what you think you are feeling or what do you feel in the situation. However, very often, people are either not necessarily going to know when they’re in the situation or they are going to use words that don’t really describe and emotion. It’s kind of funny, because we so often, without even thinking about it, in our day-to-day language, we use the word “I feel” but we don’t use an emotional word. We might say, I feel like this is stupid, or I feel that this is unfair, or I feel like I just want to get away from it all. Even though we use the words “I feel,” all those other words that follow it aren’t true emotions. That’s a common thing that happens. Another problem that is quite common that we see is people would describe their emotions and very vague ways, such as I’m okay, or I’m upset, or I’m fine. When you think about it, it’s a little bit informative, but there is so much more information that is left. If I’m upset, you don’t know if I’m anxious or fearful or angry or terrified. Don’t know. It to be some combination, but there is a lot of information that you can still get from that. The compass will basically provide you with feedback if he used a word that was too vague or you just didn’t know what your feelings were. You can use the compass, and it will guide you through asking you, was this feeling pleasant or unpleasant? And then you get to select a side. It will, to navigate you through. Then it will say, what was your emotional arousal, or what kind of emotional charge did you have? It was a higher or lower? From selecting one place to the next, you’ll get in that quadrant that will give you options to choose from. What’s nice is that it’s designed to help encourage you to think of a breadth of emotions. The other thing is when it comes to most situations, we are not just feeling one emotion at a time. We very often feel multiple things. Honestly, that sometimes can lead to confusion because you are feeling different emotions that may be competing with one another, so that might be difficult. Or you can be feeling one emotion that’s so dominant that it overshadows any other feeling. For instance, a lot of times when people feel angry – and we get that very often after a brain injury, a lot of issues with anger and aggression — that may overshadow any other emotion that might be going on. If all they are paying attention to is the anger, that’s all that’s going to come out in the behavior. But if you actually take the time to think about it and realized that there are other emotions, you may realize that maybe there is a little bit of fear and sadness behind that. Having that additional information is important for your own knowledge as well as to be able to communicate it to other people. So they really understand what you’re going through. The compass encourages people to explore a breadth of emotion they feel for a particular situation. It does this by using a point system. The more emotions that you provide in response to a situation, the more points you get, so you are encouraged to be able to think and really dig deep inside to figure out what you might be feeling. JOSH ANDERSON: I could see how this could really help people in therapy programs, and like you said, be able to tell their emotions a little bit better to someone else. And then probably find better coping mechanisms and better ways to deal with those when those big ones come out. DR. DAWN NEUMANN: Exactly. It really was designed with that in mind, that this wasn’t just an isolated tool or a tool that is used in isolation. It’s really meant to be used in conjunction with other programs. Especially, like you are saying, if somebody is in therapy. Imagine someone in therapy. What are you doing mostly with your therapist, you are talking about your emotions and how did a particular situation make you feel and how did you respond to this. If you go into this therapy not knowing and not recognizing when you have an emotional response or not even knowing how to describe it, then there is this Between you and your therapist and how is the therapist going to be able to address your needs. This, to me, is something that’s absolutely fundamental and being able to succeed in therapy and actually get benefit from therapy. JOSH ANDERSON: Definitely. You talked a lot about a traumatic brain injury and folks using this. But this app is really for anyone? DR. DAWN NEUMANN: Absolutely. Really, anyone who wants to get more emotional intelligence and more emotional insight into what they are feeling, just become more proficient in being able to process what they are feeling, being able to identify that, and being up to label it. That could be anybody from somebody with a traumatic brain injury to autism to schizophrenia to somebody in a job who realizes that emotional intelligence is really important, and I need to be able to be in tune with my feelings so that I can be better in tune with other people’s feelings, my colleagues on my employees. Or a couple who is in distress, who maybe are having some communication challenges in getting through differences of opinion. You kind of get off track and don’t really communicate with your partner what you are truly feeling and what your needs are. Sometimes using like this compass can help ground you and make it less about believing somebody else and more about explaining where you’re coming from and helping your partner understand you. JOSH ANDERSON: I can see how that could be helpful. So many times those couple fights are about the dishes, when they had nothing to do with the dishes. It’s all those underlined things that cause it. You just talking about that, can this help a 17-year-old stepdaughter? Just asking. [LAUGHTER] DR. DAWN NEUMANN: That’s a great question. We haven’t actually looked at that in research, but I think it’s a very valid question. It’s ironic you bring it up, because in one of our research studies in which we were using the emotional compass, our participant said to us — it was the entire program in general, but the compass is a big part of the program. He said, my goodness, where was this program when I was in high school and my emotions were raging and I had no idea what I was feeling or doing? He’s like, every high schooler should go through this! JOSH ANDERSON: I agree. I can remember those angry days and having no idea why. Nothing happened, nothing bad happened, but just being mad for no reason. How much does the emotional compass app cost? DR. DAWN NEUMANN: It’s $3.99. You can find it on the Google play or iTunes store. JOSH ANDERSON: Is that just a one-time fee or is that monthly? DR. DAWN NEUMANN: It’s a one-time fee. DR. DAWN NEUMANN: It’s great. What I was saying before, going back to your question about who can use it, this is something that can be downloaded by people that feel that they need improvement. But this can also be used in conjunction with a therapist. It’s a client is getting psychotherapy, and the therapist wants to use this app in conjunction with the patient, and the patient is okay with that and supportive of that. For five dollars per patient, the therapist can purchase access to the code that links up the patient use it with the emotional Compass, and that data being sent to the clouds of us that the therapist can then see the information, the frequency, the utilization, the emotions that the patient is feeling on a regular basis. Obviously, the has to be with the patient’s permission. All the therapist would have to do is contact CreateAbility and ask for this code that they would then give to the patient to input into their app. JOSH ANDERSON: I could see how that could be helpful for a therapist, especially if you are only seen them once every few weeks. How was your week? They are pretty much only going to tell you what happened the day before, not so much the whole week before. Being able to see where those highs and lows were and how frequent they are, that’s very cool. I could see how that could be helpful for both sides. DR. DAWN NEUMANN: The other thing you get to see — when I was saying to you before, when you open up the app, you have the ability to start off independently putting in your emotions. Or if you are struggling, you need assistance due to compass, it will start guiding you through. The data that gets picked up, you’ll get to see if the person independently entered an emotional word or if they were guided by the compass. At the end, how independent versus how much guidance do they need? Did this change over time? JOSH ANDERSON: What does the future hold for you and for My Emotional Compass? DR. DAWN NEUMANN: Right now we’re in the process of doing some more clinical trial testing with an ongoing study. We are one year into a five-year research study using this. It is being used in conjunction as a complement to a therapeutic program we are providing to our participants. We are really excited about this trial and hopeful for a positive outcome with this compass. Our original trial with a smaller number of subjects showed that, in conjunction with the therapy using the compass, we wound up seeing that people did have better control over their emotions and had more positive feelings. That’s good. We are hopeful for that. Also just apply for additional grant funding, hoping that ultimately this might be something that gets picked up with the military and the DoD with all of the traumatic brain injuries and posttraumatic stress disorder where we feel that this may be quite helpful. That’s some areas that we are looking to go with the compass. Potentially building on the compass. Right now, it’s very streamlined. I think as time goes on, kind of building on things to provide it with more features to make it more helpful for individuals. Emotional compass isn’t the only type of research we have. At the rehab hospital of Indiana, we have a lot of research opportunities to participate in, mostly for people with traumatic brain injuries but also for stroke and spinal cord injuries. If you are interested in finding out what types of research opportunities we have available, you can contact the research department here at 317-329-2380. JOSH ANDERSON: Well we have a little bit of time left, can you tell me a story about someone that My Emotional Compass has helped? DR. DAWN NEUMANN: I guess one of our biggest fans that went through our last trial, she really took to this emotional compass. She is somebody who had a pretty severe traumatic brain injury and had a lot of challenges after her brain injury at a variety of levels, including her emotions. She would describe herself as becoming flooded with emotions. She would get so many emotions all at once, it would just an overwhelming and flooding to her. Ultimately the surface has a lot of anger and aggression. She would fly off the handle very quickly and easily at the drop of a hat in response to any situation. She would always find herself – she would say I’m in the upper left-hand quadrant, meaning it’s the highly unpleasant, highly emotionally arousing situation. She would have all those things. Through working with the compass, she was better able to differentiate her feelings and of explore a wider breadth of emotions. She would challenge herself to get as many emotional responses as possible. She would try to think about, in this situation, what might make me feel more pleasant? Just so she could get on the pleasant side. She would start to make herself think about the situation in a different way that gave her a different perspective and made her feel different emotions and help calm down – or at least, the very minimum, minimize some of the highly arousing – bringing her from a high arousal situation to a low emotional charge, or something that’s more pleasant. She wasn’t just stuck in this one corner. It overall helped her to slow things down and figure out how she felt. I remember her describing this one situation after she finished the program using this compass, which she carries around with her all of the place. It while ago when she first participated, it was on a piece of paper. Now it’s a nice, interactive app. She was going to an event with her mom, and she was all excited, and ultimately realized that she had the wrong day. The place was closed. They weren’t able to go. She told the story like, if this happened prior to this program, to using this compass, I would’ve lost it. I would’ve been so aggravated. She said, instead of doing that, I actually started to think, how can I get on the pleasant side of the compass? She said, well, at least we got to spend some nice quality time together. DR. DAWN NEUMANN: Her mom’s like, who are you? JOSH ANDERSON: That’s awesome. That’s a very awesome. Our guest today has been Dr. Dawn Neumann, PhD. She’s talked about My Emotional Compass. And that’s available on the Google play store and the Apple App Store. Thank you again so much for being on the show. DR. DAWN NEUMANN: Absolutely, my pleasure. Thank you so much for having me. JOSH ANDERSON: Do you have a question about assistive technology? Do you have a suggestion for someone we should interview on Assistive Technology Update? If you do, call our listener line at 317-721-7124, shoot us a note on Twitter @INDATAProject, or check us out on Facebook. Are you looking for a transcript or show notes? Head on over to our website at www.EasterSealsTech.com. Assistive Technology Update is a proud member of the Accessibility Channel. For more shows like this, plus so much more, head over to AccessibilityChannel.com. The opinions expressed by our guests are their own and may or may not reflect those of the INDATA Project, Easter Seals Crossroads, or any of our supporting partners. That was your Assistance Technology Update. I’m Josh Anderson with the INDATA Project at Easter Seals Crossroads in Indiana. Thank you for listening, and we’ll see you next time.